They're back! Four years removed from their previous adventures, the former Ghostbusters are under a restraining order, and have fallen to hosting cult cable talk shows (Bill Murray's Dr. Peter Venkman) and entertaining at children's birthday parties (Stantz and Zeddemore, played by Dan Aykroyd and Ernie Hudson). Dana Barrett (Sigourney Weaver), having broken up with Venkman, had a baby with another man, but the marriage dissolved. It is precisely 8-month-old Oscar, whose baby carriage mysteriously rolls off on its own, who prompts Dana to get in touch with the Ghostbusters to make a desperate plea for help. With a strange feeling about her co-worker...intense, quirky art restorer Janosz Poha (Peter MacNicol)--she realizes that the supernatural has once again invaded her life, and who's she gonna call? 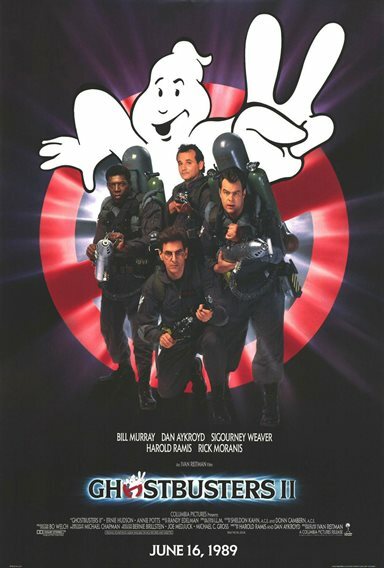 Download Ghostbusters II in Digital HD from the iTunes store. Ghostbusters II images are © Columbia Pictures. All Rights Reserved.